We’ve added some exciting features this week, including a fill and line tool, and new rails. There’s also a new Advanced Build Mode GUI! Everything should be cleaner and much easier to access now. However, keep in mind that the layout and content is still a work in progress, and so may change significantly between builds. Over the next few days, we’ll tweak what each group contains and adjust how the tools work in order to streamline the experience. This first dev build contains the core functionality of two new tools: the Fill Tool and the Line Tool. Both are available under the Shape Tools group. The fill tool allows you to incrementally fill (or replace) areas with your desired block. It’s quite simple to use: you can freely select your starting point with the camera (similar to ‘create docking’), and press the [Do Fill]* button with a block selected on your hotbar. * We are absolutely going to rename this later. For now, the filling process is done in a single step, and uses a fixed amount of blocks. We will change this over the next few builds to allow you to specify how many blocks to place at once, as well as allowing servers to impose their own limits to reduce server strain. We’ll be adding some optimizations to this in later builds. 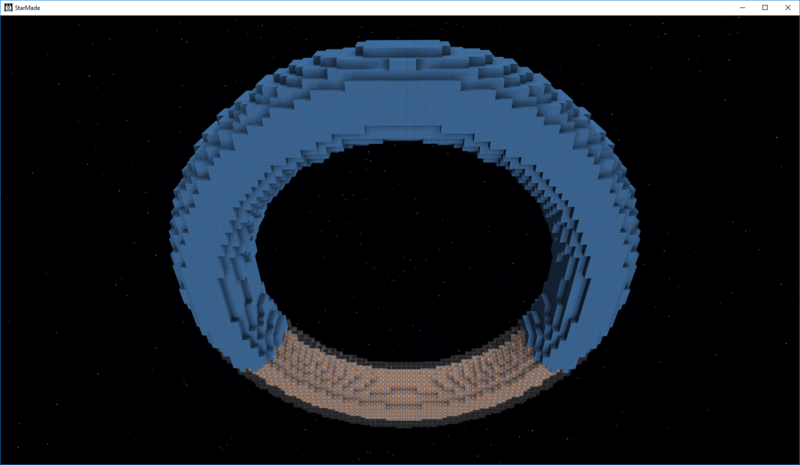 Filling the shell of the torus with blue hull, replacing crystal armor along the way. This is an addition to the build helpers. You set two points (using your camera position, as with the fill tool) and it will create a line between them. We’ll add more features in the future, such as splines and line thickness. The new GUI is much cleaner, and all of the controls are much more accessible. You may show/hide individual groups, and in later dev builds, these will be customizable in location, order and size. The game will remember these settings between instances. We’ve added new sliders, too, which allow dual input: you may enter values manually, or use your mousewheel while hovering over the controls. This also allows scrolling through the GUI without changing sliders’ values unintentionally. This is not the final version, of course, as we will continue to work on the design. This completely new system is able to produce highly-optimized meshes of any number of blocks. It will be used for several effects in the future, especially for outlining the systems of a ship (e.g. for building and/or scanning). The outline itself will also be used for selecting entities in subsequent builds for this release. This system is not able to replace the existing mesh and chunk system. Not only should any object realistically only be loaded into memory in chunks to begin with because of the sizes involved, but also in terms of graphics it’s not possible for the block meshes to retain all of the information needed. The new system simply doesn’t work with multiple textures in the same mesh. We’d have to use one mesh per block type, which would pretty much remove any advantage the system confers. Also, no lighting or material information can be stored in the limited amount of vertices of such meshes, and furthermore: making a mesh of a large object might be too much for the graphics card buffers to handle... so a chunk system would be needed anyway. However, it is absolutely perfect for far-away LoD views of a model since block types can be mapped to a low number of colors, thereby producing one mesh per color. This, when combined with a higher-granularity chunk system, should give a large FPS increase when viewing bigger objects in the distance. 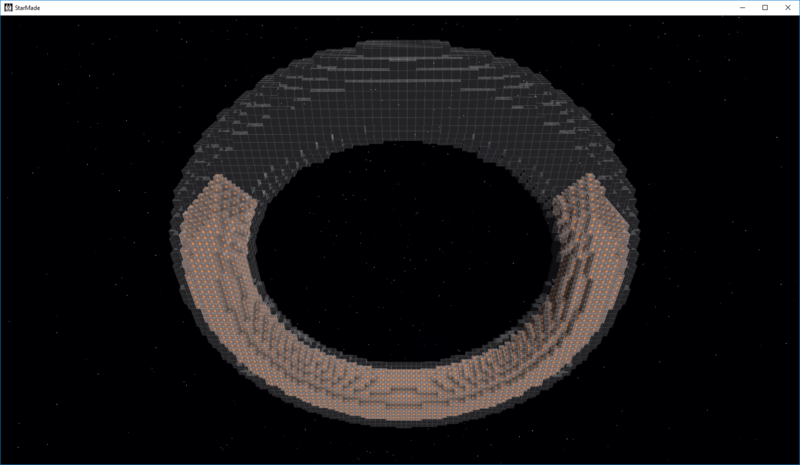 We’ve completely rewritten the chunk request system! The new approach streamlines the order of chunk requests over multiple entities. They’re now ordered in the background on a global level, meaning nearby chunks will have much shorter load times. This also benefits the lighting calculations, which should improve overall performance. Dev builds should come out a lot more frequently from this point on. Though as always, be careful and use a separate installation so you don’t risk anything bad happening to your data, as dev builds can occasionally contain game-breaking bugs. It’s with a heavy heart that we announce, Auburn is leaving the Schine team for new opportunities. He completed his project here and we are extremely proud of his work. We are currently working on its integration into the universe update coming later on. We are currently completely reworking the advanced build mode and other GUI functionality to work with a planned GUI scaling update in the future. We’d like to go in-depth for one specific build tool that we are going to add. The Fill Tool. The fill tool is one of the tools we are most excited about. It fulfils quite a few purposes that the community has been asking for and will help you update your ships in the future power update. Once you engage the tool, it uses the camera position to determine where the fill area starts. When the user confirms the fill location, the game will use the highlighted block type to flood fill up to a number of blocks set by the user. Each click on “fill” will then add a set amount of blocks (maximum amount per step determined by the server). 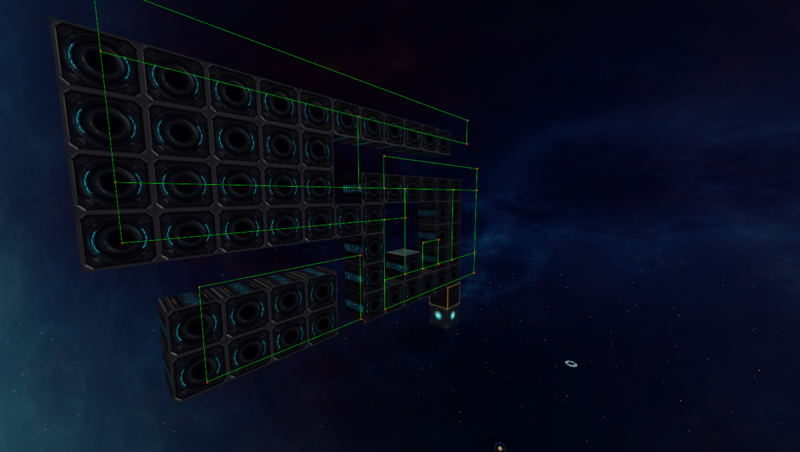 It will keep track of the blocks already placed so it will reach even into the farthest ends of your ship. Alternatively, it can be used to make some cool spherical shapes on your ships. The great thing about this tool is it isn’t only for filling empty blocks. It can also be used to fill over existing blocks. One way this will be useful as a “Paint” tool. You can select which block type to replace when filling. The default is the “Empty” type and it would work like described before as a normal fill tool. But you can also select “Grey Hull”, which would replace groups of touching grey hull blocks on your ship. It, of course, would replace special shapes like wedges or slabs with the right shape of the replacement type if possible (grey hull wedge -> red hull wedge with the same orientation). Another tool we’re working on is the Line Tool. We will implement this in two stages. The first stage will be a simple version. Just like in “Create Docking” you will be able to select two points on the grid (the free point selection is something we will also add for other build tools). The helper will make a line between those points which can be used as a reference or to restrict building/removing just like any of the other build helpers. Additional stages will add line thickness and additional line segments that can also be set to splines, which then would enable you to make curves. In our discussions about build mode item handling, we also remembered the inconvenient cargo handling that players have to go through, in case they want bidirectional cargo transfer between a station and a ship. The current system is too complicated and also doesn’t allow for item flows down a docking chain. Altering the feature will open a better way to transfer cargo. The way we will do this is to add two new rail blocks: Rail-Unload and Rail-Load. The visual difference will make it easy for players to see what the dock is before docking. All connected inventories to your docker block will either be loaded or unloaded to or from the entity you are docked to. These 2 rail blocks will be swappable through logic interaction just like the other ones. To prevent exploitation, a ship can be set into four modes: “Always Allow Transfer”, “Deny Transfer”, “Always Ask”, and “Only ask for different faction”. When your ship is set to “Always Ask” (default), whenever you dock to an Unload or Load-Rail, the pilot will get a dialogue asking him to confirm the transfer. If there is nobody to get the dialogue, the transfer will not start. Of course, the transfer can at all times be manually triggered on/off via a ship’s hotbar, and the mode can always be changed in the ship menu. As for the next dev build, we should be able to release one at the end of this week, followed shortly after by a pre-release the next week if all goes well. 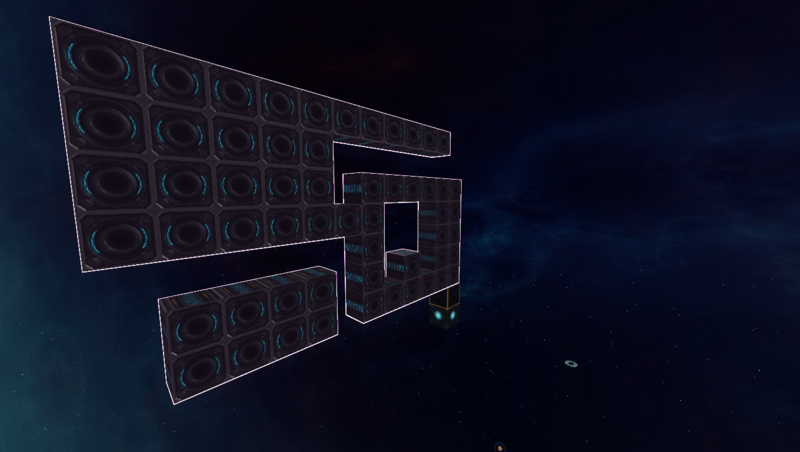 And as always, thank you for playing StarMade! The dev blog for this week features something more on the technical side. It covers a nice feature that will be very important in going forward. With the preview of last week, which is being able to draw any subset of blocks on any structure, we want to share another reason why we implemented this now. Not only is it already extremely useful for making existing GUI elements better and as said, adding new systems like active scanning, it also will be our basis for a new Level-of-Detail system. This system will increase drawing performance by drastically reducing the amounts of polygons at a distance. For that, the meshes we had last week needed to be improved and optimized. Since these are one colored representations of a set of blocks, polygon reduction is extremely viable. First of all, however, it needs to be explained why this method is not viable for all the mesh drawing, especially close. Reducing polygons means giving up information that is stored in those vertices. In our case that is texture information, the baked lighting, material, and a lot of other graphical meta information. Some of that can be compensated with techniques like deferred lighting, which would work yet does not scale well most of the time, and will force a lot of other optimizations to be removed. Also, the more detailed the mesh is with additional shapes, the less advantage the polygon reduction will provide. That’s why combining both techniques will give us the best result. At a distance we can draw a minimal mesh that will speed up things dramatically. We can even make that multicolored with mixing multiple meshes on a fixed map of colors. Best of all, for close up, this still gives us the option of using deferred lighting eventually, but mixing it with existing lighting to have a smooth transition at a distance for maximal performance combined with the cool graphical experience of dynamic lighting. As an example, we just take one side of the mesh. In production, this algorithm applies to all sides and all ‘depths’ (layers). Individually, however, we are looking at a 2D mesh. This is the raw drawing, which each block representing a full square. As you can see, the amounts of vertices and polygons are pretty high, especially if only one texture would be used. The algorithm itself at this stage records all vertices and its connections to other vertices, as well as diagonal vertices individually. Diagonals are handy to know that there was a filled out block at that position, and not just a one block gap. The first step for the algorithm is to remove inner vertices. These can be easily identified by checking the amounts of diagonal vertices a vertex has. If the number is exactly 4. We can remove it. At the same time, we can remove unnecessary connections. This is a bit more complicated to explain. Essentially for each non-inner vertex, we check for each existing direction the two orthogonal neighbors in the same direction. If both exist, the connection is unnecessary. A similar approach is used to remove the vertices that are not corners. Now the mesh is as simple as it can be. However, to draw it, we need to define triangles. There are several methods to triangulate a mesh, and it is highly complex, especially doing it with concave polygons that can have multiple holes in it. For our case, we can make the process a lot faster by using the fact that we are on a grid. A fact that is often overlooked in a lot of projects, but since starmade is primarily a voxel game, can be used as the source of countless optimizations. Explaining the exact process of retriangulation would take way too long for this dev blog, but you can probably understand the overall process of inserting horizontal lines at key points to subdivide the mesh into rectangles. From there, it is rather straight forward to get actually triangles that can be drawn. Now we do this for all sides, and their layers, and we get a mesh that is highly optimized, and doesn’t have any strangely shaped triangles (extreme angles). This has the great advantage of being able to use well formed texture coordinates if needed. As a final step (for the highlighting), the mesh is drawn into a frame buffer and rendered with an outline shader. As announced, we have a dev build in the making which we will release when it’s ready for public testing. Here’s another weekly dev blog! In the wake of the power update, we’ve identified a few features that overlap nicely with the new power system and other ideas we’ve had for quite some time. One of these features is the ability to draw groups of blocks separately and apply various graphical effects to them. Among other uses, this will allow us to display the inner workings of ships quite nicely, e.g. highlighting a specific salvager/weapon array, a circuit, damaged blocks, etc. There are several existing uses for this, but it will be especially useful on future features, such as: scanning other ships, getting an overview of your reactors, highlighting potential issues therewith, etc. We’re aiming to do a release with this feature implemented in quite a few areas. We will be updating Advanced Build Mode with increased functionality. This will include the above highlighting, as well as new tools. This update will not only make reactor design much easier (and allow integration of their features), but it will also give players better building tools in general. Among these planned features is a fill tool, which will allow you to progressively fill any area, as well as tools to draw lines and possibly arcs. Thank you again for additional feedback. We went through most it, and we will be addressing more of your concerns later on where needed. After reading all of the concerns and debates over the new power system, we can address two of our major concerns players had with the mechanics. 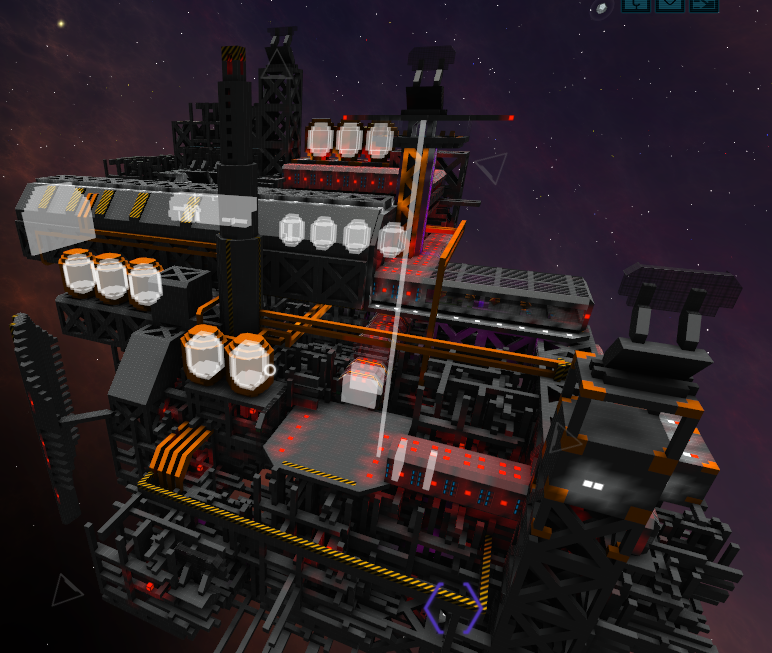 The first is that players are limited to a single active reactor per ship, and the second is that only a single reactor would ever be active for a group of docked entities. We agree that some of these issues may be valid, but are not something we can easily solve in a balanced way. We came to the conclusion that implementing a working multi-reactor system right now would compromise the whole reactor system as we do not know that system on its own works in-game. That’s why we’ve decided that after implementing the base system (and after its initial balance passes) we will look into the concerns about the single-reactor issue again, to have a better overview on the possibilities in this system. Specifically, we will re-examine allowing docked entities to have their own active reactor, and possibly even allow multiple active reactors per entity to see if we can find a balanced, non-exploitable way to implement them without introducing countless rules and restrictions.